I’m trying to go just a little easy on myself this Christmas season. It’s one of the busiest times of the year at my job job, and with all the shopping, decorating, travel planning, and crafting, not to mention the whole “growing a human thing” which has me exhausted by 9 pm each night, I don’t need to go baking a bunch of cookies I probably shouldn’t be eating anyway. At least, this is what I tell myself. The reality is that last Saturday I found myself with 3 dozen cookies to deliver for a bake sale for charity, and 5 dozen to deliver for a cookie swap. I guess there’s no escaping the cookies. 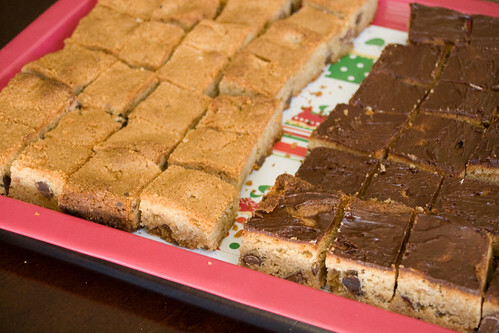 Fortunately, some kind soul long ago invented the bar cookie, which have the advantage of being delicious, baking up in one batch, and easily cutting up into 3 or 4 or 5 dozen individual bites of goodness. 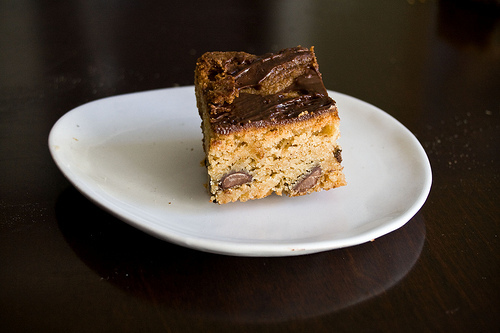 These hazelnut blondies, inspired by things like Nutella and my favorite condiment, are simple and a little individual. You don’t see them everyday, and the rich taste of the hazelnuts just make these a perfect holiday cookie. The cookies do take an extra step of making your own hazelnut butter, which is pretty quick work in a food processor (though you do have to toast and skin the hazelnuts, never my favorite chore). Still, the deep flavor of toasted hazelnuts makes that one extra set of dishes worthwhile, and I hate doing dishes. If you’re roped into baking Christmas cookies this season, (or you want to. That’s possible to.) These are delicious and relatively painless. Place the toasted, skinned nuts in the food processor, process until chunky, add the honey and the salt, and continue to process until smooth. Preheat oven to 350 degrees. Grease and flour a 10 X 13 inch baking pan. In a mixer at medium speed, cream the butter and sugar until fluffy. Add the hazelnut butter and beat until incorporated. Add the eggs, egg yolk and vanilla and beat to combine. Reduce the speed to low, add the flour and salt and beat until just combined. Add the chocolate chips and stir in by hand. Spread the batter into the prepared pan. Bake 40 minutes, or until a toothpick comes out clean. Let cool in the pan, then cut into squares. You can top these with additional melted semisweet chocolate, spread on prior to cutting.